Are You a Member of the Board Direction LinkedIn Group? Why is it a good idea for you to join the Board Direction LinkedIn group? Building the right connections are crucial to your board appointment. An easy way to begin is by joining our LinkedIn group. *|FNAME|*, if you have read any of my posts in the past you will know how important I think developing connections are in gaining a board appointment. In fact, I have this conversation with my members on an almost daily basis. Why are they so important? Well, a recent study I conducted recently found that approximately 65% of board appointments occur via a personal connection. This won't come as any surprise. Instead, the challenge will be to know who these connections are and how to connect with them in a meaningful way. As you know I am a big supporter of LinkedIn (I am a Top 10 user with 30,000+ NED connections) because it is a fantastic, and under-utilised, way to develop the sort of connections you need to get appointed in a really appropriate way. 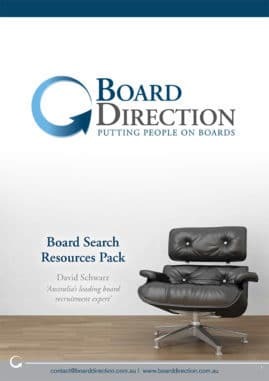 Because so many board appointments are made as the result of someone having their 'ear to the ground' - if you are connected to the right people odds are you will hear of new board vacancies and may even be introduced to the decision makers who have to choose the right candidate to fill a certain position. And this is exactly where our Board Direction LinkedIn Group comes in. Isn't it enough to be connected on LinkedIn? Let's face it, having thousands of connections who you never communicate with is just folly if you expect that alone to lead to a board appointment. Instead, to effectively build powerful connections using LinkedIn, and like any social media platform, you must carve out time to dedicate to doing this. The more time you dedicate to pursuing opportunities and engaging with your connections, the more this approach will work. One good shortcut you might consider that will help you build your profile, create opportunities for yourself and develop appropriate connections, is to join appropriate LinkedIn groups. Keep informed about our exclusive & advertised board vacancies. New board vacancies are advertised on the Board Direction website. However, with our busy lives, it's often difficult to remember to regularly check the website. If you are a member of the LinkedIn group, you are able to receive reminders of new vacancies on the website + all of our exclusive board recruitment roles we send only to our members. Access all our 'How to' articles about governance and gaining a board appointment. Knowing what goes on in the field of board appointments and receiving some insider tips through articles posted on the Board Direction LinkedIn group, you may have a much-needed edge over the competition. Keep informed about upcoming exclusive events so you don't miss them. Joining will enable you to keep informed about upcoming masterclasses and breakfasts in your city. Build valuable relationships. Being a member of the Board Appointments (Australia) group, gives you access to other NED's, enabling you to connect with these members through the group. Other NED's will be more prone to connect with you if they can see you have a shared interest like the Board Direction LinkedIn group. A word of warning when using LinkedIn, joining groups or connecting with others - it is essential that you have a well composed LinkedIn profile. Whilst following the right people and building your own network are all very important aspects of building your network you must ensure there is an appropriate substance behind your engagement with your networks. Beyond this, don't take it too seriously - what is the worst that could happen? Most on LinkedIn are happy to engage and give their opinions. Be bold, introduce yourself, offer to help, be curious and enjoy the experience. Stay informed by joining the Board Direction group on LinkedIn and let us help you dare them not to appoint you.